These images were all taken with the new Lumix G9. I had the good fortune to carry this camera on safari in Kenya for 2 weeks, a Micro-Four Thirds camera designed from the ground up for wildlife and sports photography. It has a much larger view finder than you would expect from a small camera body, to help drive the autofocus system. There's a couple of neat tricks as well to let you magnifiy into a scene and be very very precise with where you direct the AF. Accuracy is the key element here. Shooting a weaver bird hiding deep inside a mass of acacia branches is very very tricky for any AF system, and the new G9 let me target the birds and pull them out of the chaos. The high speed continuous modes are quite insane, offering up to 60fps in RAW. I found myself stepping back to more modest 15fps. There's a dedicated dial on the body to move from different continuous rates, plus you can set what those rates correlate to in the custom modes. So I had normal low speed continuous for street shooting and then I roll the custom dial to my wildlife default for faster frames and higher shutter speeds. Panasonic's new Lumix G9 really surprised me. Combining this modest sized and very light camera body with their 100-400mm telephoto zoom gives you effectively 800mm reach in something that feels no heavier than a laptop. I had it with me all the time, even when walking around the tented camps. Which is where 50% of my bird shots happened. You can see for yourself what the results were. Many of the photos presented here were birds that were in reality too far away to get a really good photo. 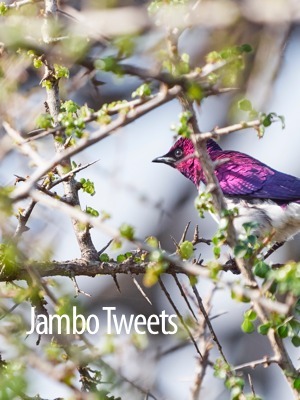 I included things like the Red-fronted Barbet not because it was a killer shot, but because I want to share the amazing diversity of bird life you can experience in just two weeks travelling around kenya. The other thing to note about this set of images is that most of them were taken in really bad light. Deep inside the darkened canopy of trees on a cloudy day, with rain storms brewing in the early afternoon, is not the best light for shooting birds. Add to that my choice to drive the camera with a minimum of 1/1000th of a second shutter. I'm pushing the ISO very very hard with this kind of shooting, and still the images come through beautifully. Sometimes I fell short of course, like the Sunbirds which need about 1/4000th of a second because they move at such ridiculous speed. Or when trying to chase Firefinches in the dying light of the evening. ISO is one thing, but boring flat light is another. Regardless, you get shots with this camera system in the most demanding of situations. If you are a bird fan and want a camera setup to help you capture some of the beautiful creatures you enjoy seeing, then I can fully recommend the Lumix G9 coupled with the 100-400mm Leica. The other lens I used on this trip was the new 200mm f/2.8, with 1.4x and 2x converters. Most of the time I just used the 1.4x, giving me close to 600mm prime reach. The image quality for this combination was amazing. The 200mm is a little heavier than the 100-400mm zoom, but not so much that you'd worry. As is usually the case with birds, you can never get quite close enough so shooting with a prime instead of zoom was not an issue. Finally, my gratitude to Panasonic Australia for letting me travel with this gear. I would not have captured everything I did had I carried my regular DSLR setup. I wouldn't have had the freedom to travel light, to just bring along 600mm of telephoto when strolling to lunch, or to jam 6 different lenses into my Flipside along with two bodies.